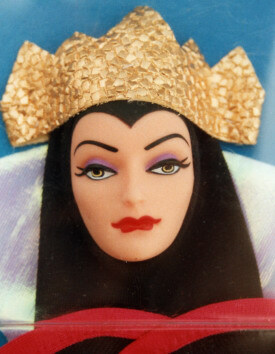 Go here to see closeups of the dolls' faces; female, male, masks.  Click the thumbnails to see the pictures in a bigger version. 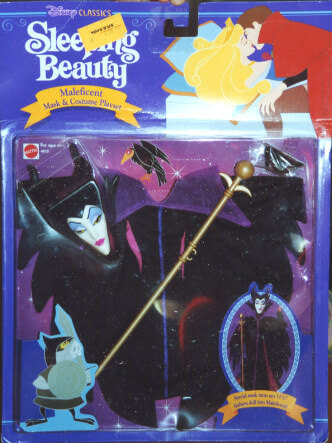 This was a giftset with a video; I got it from my sister but she kept the video. Too bad, it would have been great to have NRFB now, as it was a European Special... You DO make mistakes in the beginning! 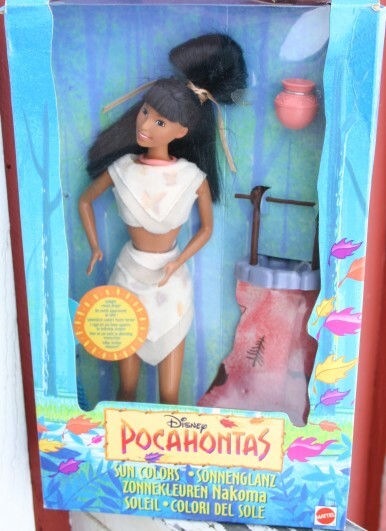 The doll is the same as in the regular edition sans the plain dress. 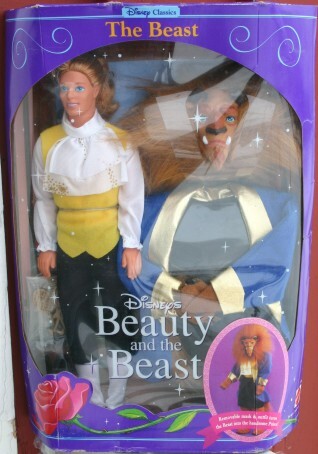 Prince and a costume for him to be the Beast. 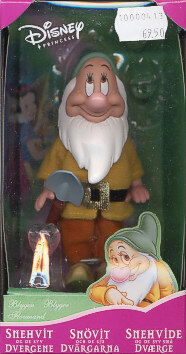 See a closeup of the mask in the faces section; male Disney masks. 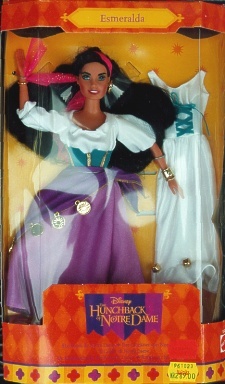 I once saw the fashion set with the Fairy Godmother and can't figure out why I didn't buy it! 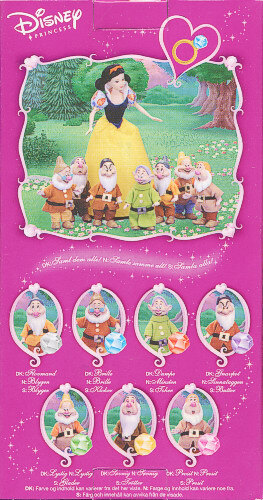 As far as I can recall we didn't get any of those sets but that one. 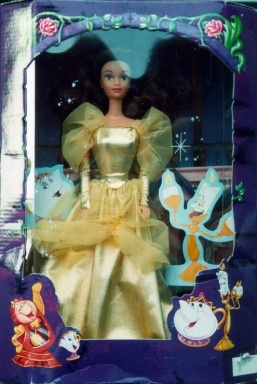 This is the first Cinderella doll that was released in 1993(?) 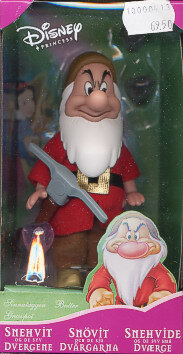 - boxdate 1992. 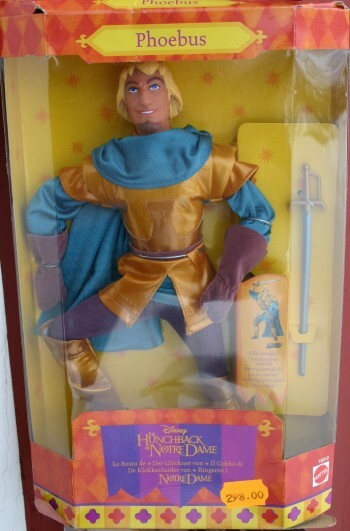 Cindy's prince showed up at a toy store at reduced price. Lucky me - and Cinderella. This girl has eyes that "close and open" with wamr/cold water. 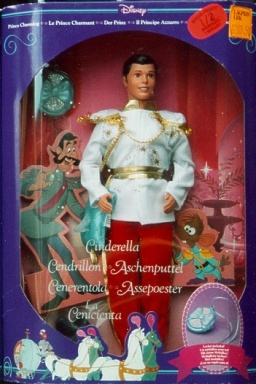 Aurora's prince that gave her the reviving kiss. 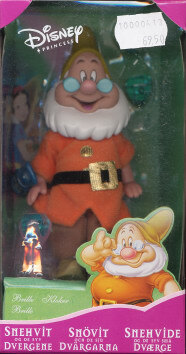 My mom picked this one up for me. I don't really like her molded earrings. 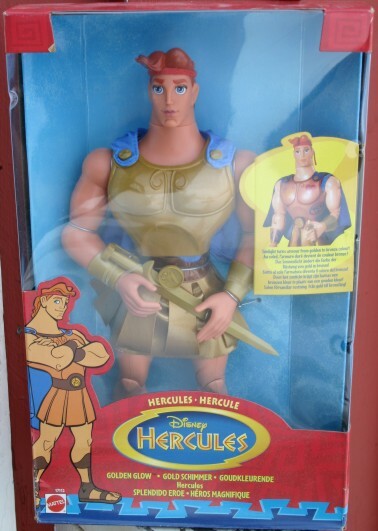 Can anyone figure out why Mattel did that? 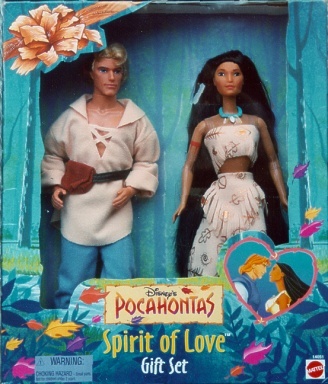 My sister bought this Pocahontas and John Smith set in Greece for me. Isn't she nice? 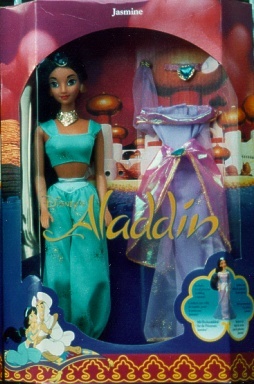 This is one of the narrow-box dolls, in a swimsuit under her skirt. 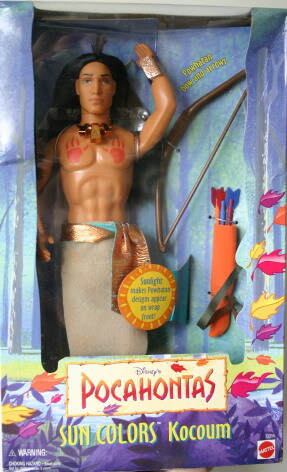 Tthis guy is huge compared to the regular Ken sized bodied dolls. .
One of the few dolls my husband have bought for me. 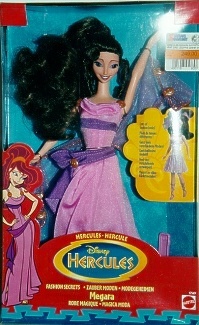 Another narrow-box doll, Megara in a turquoise dress. 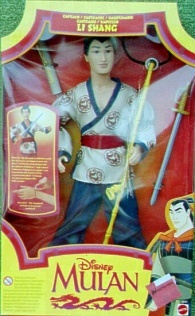 Mulan in a narrow box. This version had a toothy smile and a gorgeous Chinese outfit. A very nice Asian guy with rooted hair put up in a ponytail. 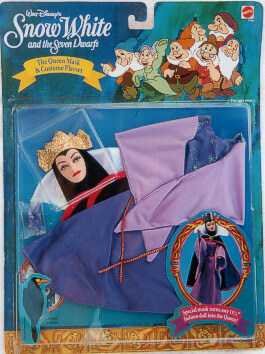 The Evil Queen from SnowWhite was released as a play set with a mask and costume. 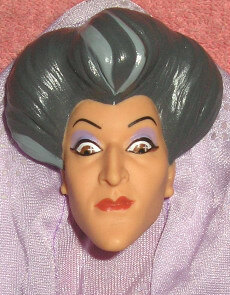 Click here for a close up of her face. 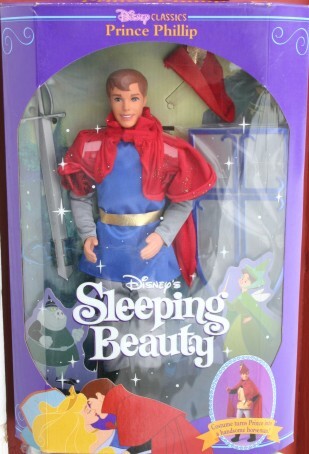 Sleeping Beauty's evil stepmother was released as a play set with a mask and costume. 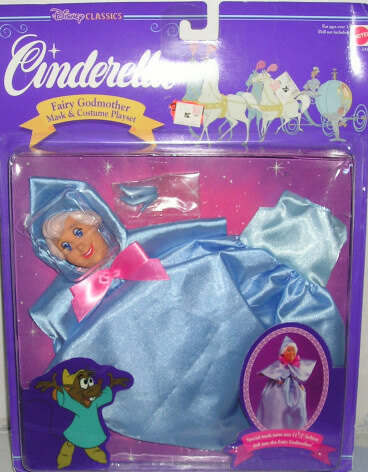 The wonderful Fairy Godmother was released as a play set with a mask and costume. 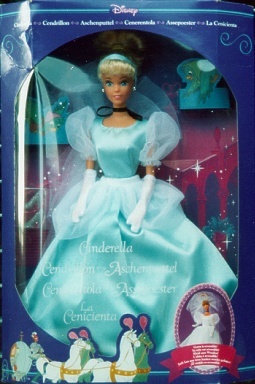 There was another mask costume relesed from Cinderella; the Stepmother. I only have the mask yet but want the whole set with the costume. 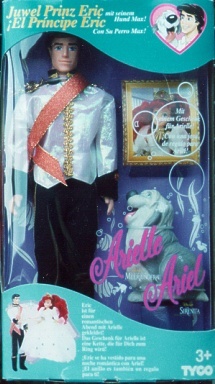 Ariel has loooong hair in this version. By Tyco. 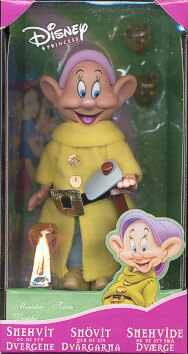 Max is made of all-plastic and does not look like a fur-ball. By Tyco. Together in Paris Anya - Anastasia before she remembered who she was. 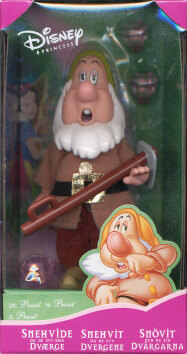 By Galoob. 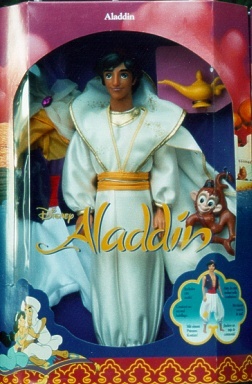 Not Disney but just as good! 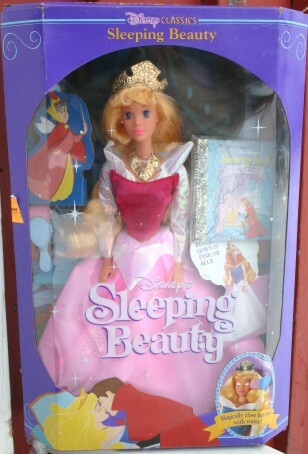 In 2001 Simba Toys got the license to make Disney Princess dolls and sets. I couldn't resist this set with SnowWhite and a "Bambi" figure that was released in late 2003. Quite lovely. 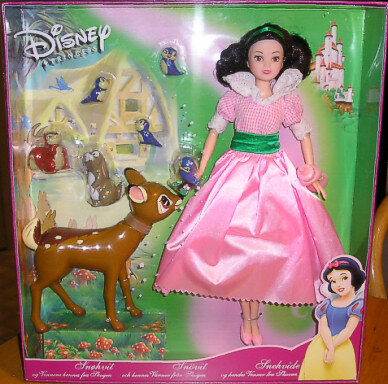 I need to take a new look at the movie though to refresh my memory of her pink dress. 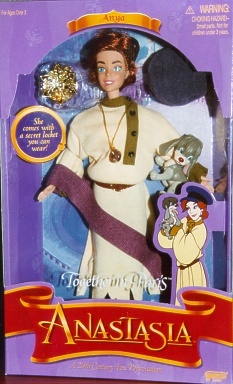 Did she have one? Snövit och de sju dvärgarna. 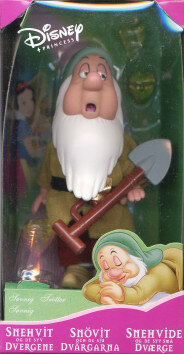 These guys are made by Simba Toys and I got them along with the Simba Toys SnowWhite in pink above. 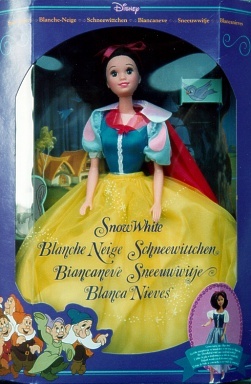 Always hard to resist such well made dolls and SnowWhite is one of my absolute favorite Disney movies. 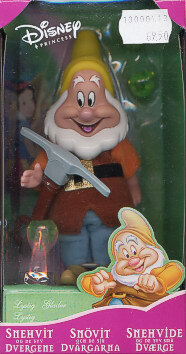 Click here for the Dwarf box back. JAKKS Pacific made this cute Gift Set with four little Princesses from some of Disney's most popular fairy tales. 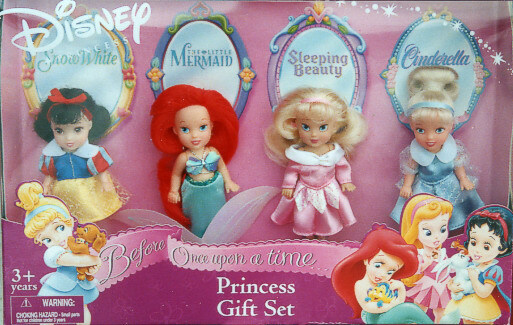 You have a SnowWhite, The Little Mermaid, Sleeping Beauty and Cinderella as dolls in the 4" size, each to the spot of their character.